The Museum of Nature & Science in Dallas is currently running an exhibit called "Chinasaurs" that features dinosaur fossils discovered in China. 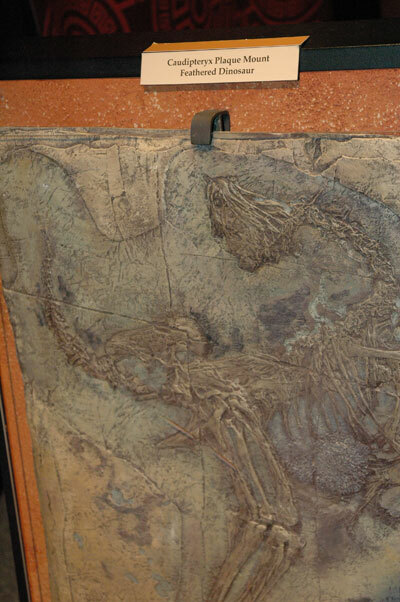 Some of these fossils supposedly represent transitional species from dinosaurs to birds. But these "feathered dinosaurs" appear to be missing a key feature—namely, the feathers. But rather than showcasing real feathered dinosaurs, the exhibit only offers displays that don't provide any evidence for "the rise of birds from among certain dinosaur lines. "1 For example, one features a painted fiberglass facsimile of the in-situ fossil of the "feathered dinosaur" Caudipteryx. Oddly enough, the model had no clear indications of either fibers or feathers. Is this kind of display adequate to support such a key part of the evolutionary story on the origin of birds? Caudipteryx did not have a bird's keel bone or a bird-like beak. And unlike birds, it had hips that permitted free movement of its thighs.2 Thus, it was most likely a dinosaur, not a bird or a transitional form. No reptiles have feathers today—only birds do. Were any fiber-like impressions found on the original fossil caused by something other than feathers? Perhaps they were artifacts of the fossilization process, or partly decayed skin fibers. The Chinasaurs exhibit offered no real science to back up its grand claim that some kind of dinosaur evolved into a bird. Instead, painted illustrations of what feathered dinosaurs "may have looked like"1 only illustrate evolution's feathered fairy tale. Chinasaurs: A New Dynasty of Dinosaurs. Museum of Nature & Science. Posted on natureandscience.org, accessed August 19, 2011. Thomas, B. Fixed Bird Thigh Nixes Dino-to-Bird Development. ICR News. Posted on icr.org June 22, 2009, accessed August 19, 2011. Feduccia, A., T. Lingham-Soliar, T. and J. R. Hinchliffe. 2005. Do Feathered Dinosaurs Exist? Testing the Hypothesis on Neontological and Paleontological Evidence. Journal of Morphology. 266 (2): 134. Thomas, B. Fossil Fibers Befuddle Dinosaur Evolution. ICR News. Posted on March 31, 2009, accessed August 24, 2011. Article posted on August 25, 2011.